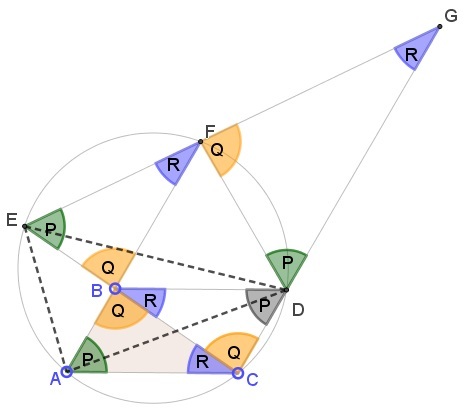 Prove that, in every two-coloring of the plane, there are monochromatic triangles of any shape. That is to say, there are three points of the same color that are vertices of a triangle similar to a given one. Let the two colors be red and blue. 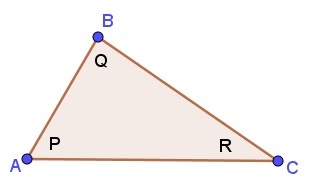 Let there be triangle $PQR;$ two of its angles are bound to be acute. Let $P$ be one of them. Find $E$ and $F$ at the intersections of $(ACD)$ with $CB$ and $AB,$ respectively. Recollect that points $B$ and $C$ are of the same color, say, blue. If $A$ is blue, the construction, though edifying, was unnecessary. So assume $A$ is red. If $D$ was blue, we would have been done with $\Delta BCD.$ So assume $D$ is red. If $E$ is blue then, assuming the worst, in $\Delta ECG,$ $G$ is red, and to avoid having $\Delta DFG$ monochromatic, we are forced to assume that $F$ is blue. But then $\Delta EBF$ is monochromatic. So that $\Delta AED$ is also similar to $\Delta PQR$ and is monochromatic: all its vertices are red. We can always find three points $A,B,C$ of the same color such that $B$ is the midpoint of $AC.$ Let $\Delta ACF$ be similar to the given one. Find the midpoints $D$ and $E$ of $AF$ and $CF,$ respectively. 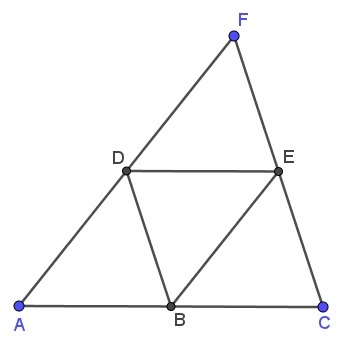 We have four small and one big triangles similar to the given one. Assume $A,B,C$ are blue. If $D$ is blue, $\Delta ABD$ is monochromatic. So let $D$ be red. If $E$ is blue $\Delta BCE$ is monochromatic. So, assume $E$ is red. If $F$ is blue, then $\Delta ACF$ is monochromatic. So, assume $F$ is red. But then $\Delta DEF$ is monochromatic. This is a problem from R. Honsberger's Mathematical Delights (MAA, 2004, pp 177-178.) The problem was originally proposed by Stephen W. Knox (Mathematics Magazine, Problem 1465, February 1996). Solution is by Achilleas Sinefakopoulos. 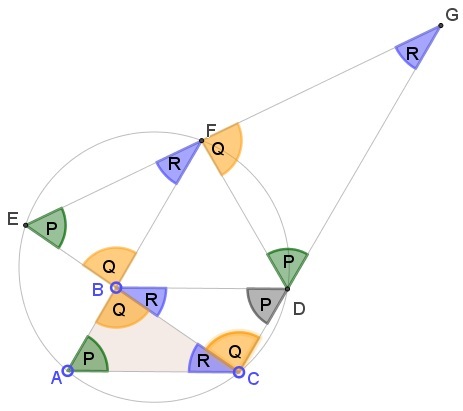 Solution 2 trivially generalizes a particular case of monochromatic equilateral triangles that was considered separately years ago.